Is YouTube an active host and, if so, ineligible for the safe harbour protection within Article 14 of the E-commerce Directive? As readers with an interest in intermediary liability know, this is not a novel question: indeed, it has been already raised a number of times before national courts. A few weeks ago, in a decision available on Marchi & Brevetti (sentenza 7 April 2017 No 1928, RG 38113/2013, Delta TV v Google and YouTube – judge rapporteur: Guglielmo Rende), the Tribunale di Torino (Turin Court of First Instance) revisited this issue, and provided an interesting response. Readers might recall that this decision follows other interim rulings commented on this blog here and here. Back in 2013 Delta TV, which produces and owns the copyright to a number of South-American soap operas (including audiovisual works for the Italian, Monaco, Swiss, San Marino, Maltese, and Vatican markets) brought proceedings against Google and YouTube. The claimant submitted that, if one searched Google's search engine by using the title of the soap opera at issue, on the first page of results there would be a link to YouTube where relevant episodes, accompanied by advertisements, would be available without Delta TV’s permission. · Delta TV did not submit any valid takedown requests before bringing proceedings. This was because a generic cease-and-desist letter without the indication of relevant URLs would not be adequate to trigger any obligations of removal on an intermediary like YouTube. Following an interim phase [see above], the Turin Court of First Instance ruled as follows. The judge noted at the outset that the videosharing service managed by YouTube should be in principle considered akin to that of a hosting provider, and – as such – eligible for application of the liability regime for hosting providers within Article 14 E-Commerce Directive/Article 16 Decreto Legislativo 70/2003. As a consequence, there could no preventive, general monitoring obligation on YouTube, pursuant to Article 15 E-Commerce Directive/Article 17 Decreto Legislative 70/2003. Having said so, the judge turned to consideration of whether YouTube should not be regarded as merely passive and neutral, but rather as an active host which, as such, would be ineligible for application of the safe harbour regime. This would be so on consideration of an allegedly active role on the side of YouTube to organize, and promote the content hosted on its platform. The notion of ‘active host’ has been subject to criticism, and the Milan Court of Appeal actually called it “misleading” in relation to hosting providers (sentenza 95/2015). According to the Turin Court a host would become active and - therefore - fall outside the scope of the safe harbour regime, when it intervenes by modifying or taking part in the elaboration of the content hosted on its platform. · Makes it possible for users to make the videos visible only to their own contacts, thus excluding general availability of videos to YouTube users and – by doing so – possibly hiding unlawful content. “only an intervention that alters a video uploaded by third parties is suitable to remove the exemption from liability within Articles 16 and 17 of Decreto Legislativo 70/2003. 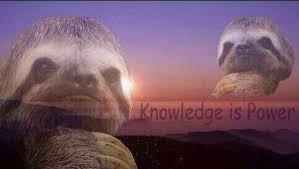 Vice versa, an intervention that valorizes that video, by adding it to an index, matching it with advertisements adequate to the relevant type of video, or making it visible to similar videos – does not remove the neutrality [of the hosting provider], because it does not affect the content of the video. Nor is it possible to repress the fact that such behaviours are all finalized to increasing the economic revenue of YouTube, as that is acknowledged by the law where, under Article 2(a) of Decreto Legislativo 70/2003, expressly refers – as the scope of application of such piece of legislation – to “the economic activities carried out online”, that must be identified as “information society services”. In light of the foregoing, it follows that YouTube is eligible for the safe harbour regime within Articles 16 and 17 of the Decreto Legislativo. Turning to the content of a takedown request, readers will probably remember that Italian courts have adopted different approaches. While there is a line of cases that requires the indication of the URLs relating to the relevant content to be removed, there are also decisions [here, here, and here] that have found that the mere indication of the title of the work whose related videos must be removed suffices. The Turin court recalled that the technical counsel it appointed had observed how a mere search of content by title would return a “very” significant number of false positives, ie content that should not be removed. According to the technical counsel it would not be possible to identify univocally all the relevant videos to be removed only by providing the commercial title of the works they relate to. The court concluded that only indication of the URLs would allow the unequivocal identification of the content to be removed, although – of course – it would not help preventing future uploads through YouTube’s ContentID programme [what is required to this end, in fact, is the provision of relevant reference files against which possible matches can be found]. The court accepted that a platform like YouTube can prevent the re-uploading of content previously removed. Although the judge noted that a slight alteration of the video at issue would result in an alteration of the related HASH value, the provision by the relevant rightholder of reference files to be used within ContentID might reduce – yet not eliminate completely – this problem. “being this fully possible from a technical standpoint, yet with a slight risk of failure, there subsists on YouTube an actual legal obligation to prevent further uploads of videos already flagged as infringing of third-party copyrights”. Further to Article 14 E-commerce Directive/Article 16 Decreto Legislativo 70/2003, a hosting provider is not responsible for the information stored at the request of third parties, but only upon the condition that it is not actually aware that the activity or information is unlawful. “Such knowledge surely arises when a third party notifies an infringement of his/her copyright, and the uploader does not seriously or at all contest such notification. Delta TV claimed that, after serving its writ of summons to Google and YouTube [this, unlike the earlier cease-and-desist letter contained indication of the URLs relating to the videos for which removal was sought], there were several visualizations of the relevant videos. According to the court, Google and YouTube should have expeditiously removed the videos and prevented further uploads, but this only occurred in part. Among other things, the videos – while no longer visible from Italy – remained visible from abroad. For these reasons, the court partly [it rejected the request for damages relating to missed compensation for private copying] accepted Delta TV’s request for damages for copyright infringement, and ordered Google and YouTube to pay EUR250k further to an equitative assessment of the price for the missed authorization for the use of Delta TV’s works. Yesterday this blog reported that the Court of Justice of the European Union (CJEU) has issued yet another long-awaited judgment, this being the decision in Filmspeler, C-527/15. At the time of writing, the text of the ruling was not yet available. 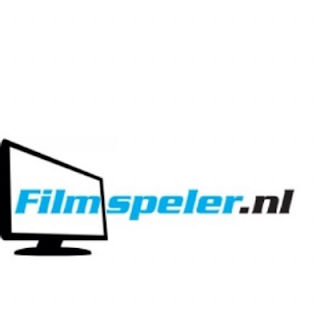 Now that it is and having had a chance to read it, it seems to me that – despite its highly specific factual background (sale of multimedia players enabling free access to audiovisual works protected by copyright without the consent of the rightholders) - Filmspeler is a MAJOR copyright decision. 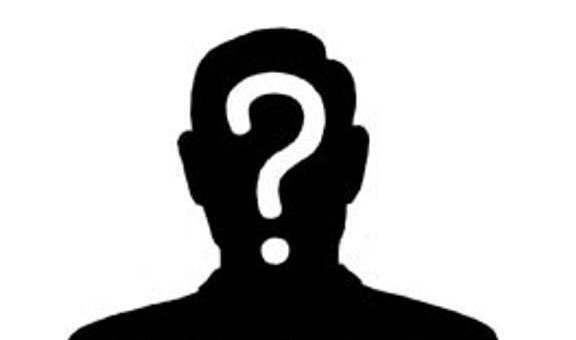 · First, because the Court relaxed the notion of what amounts to an ‘indispensable intervention [the judgment does not even contain a reference to the intervention being ‘indispensable’] for the sake of the right of communication to the public within Article 3(1) of the InfoSoc Directive. This means – as I also suggested in this article on GS Media written for Common Market Law Review – that a broader group of defendants might be now regarded as primarily liable for unauthorized acts of communication to the public. · Secondly, because the Court held that streaming unlicensed content can amount to copyright infringement, on consideration that the mandatory exemption for temporary copies within Article 5(1) of the InfoSoc Directive would not be applicable. This paves the way to holding not only those who provide unlawful streams, but also viewers of such streams, liable for copyright infringement. The first issue for the Court to address was whether the concept of ‘communication to the public’ must be interpreted as covering the sale of a multimedia player on which there are pre-installed add-ons, available on the internet, containing hyperlinks to websites - that are freely accessible to the public - on which copyright-protected works have been made available to the public without the consent of the rightholders. As usual, the CJEU recalled at the outset that the right of communication to the public, which is preventive in nature, must be interpreted broadly. This is so in order to fulfill one of the objectives of the InfoSoc Directive, ie to grant authors a ‘high level of protection’. Provided that an act of communication to the public requires (1) an act of communication directed (2) to a public, what actually amounts to an act of communication to the public also requires an individual assessment and taking into account several complementary criteria. These – as the CJEU noted in GS Media – are not autonomous and are interdependent, and must be applied both individually and in their interaction with one another. At para 31 of the Filmspeler decision the Court recalled that among such criteria, there is “the essential role played by the user. The user makes an act of communication when he intervenes, in full knowledge of the consequences of his action, to give access to a protected work to his customers and does so, in particular, where, in the absence of that intervention, his customers would not, in principle, be able to enjoy the broadcast work”. · The defendant's link circumvents restrictions to access. Filmspeler is different. Although possibly a natural evolution of GS Media and preceding case law, it seemingly broadens the framework of liability. This is essentially because the intervention needed to fall within the scope of Article 3(1) does not require to be strictly indispensable: mere facilitation seems enough. The Court excluded that the sale of a multimedia player could be regarded as akin to the mere provision of physical facilities [this is outside the scope of Article 3(1), as Recital 27 in the preamble to the InfoSoc Directive clarifies], and concluded that the communication at hand to would be to a ‘public’. Having established that in the case at hand there would be a communication to a new public, the CJEU turned to GS Media, and noted that: (1) the defendant has knowledge that the content linked to is unlawful ; (2) the defendant has a profit-making intention. Readers will remember that in GS Media the CJEU failed to provide guidance on how the profit-making intention criterion should be assessed: should one consider whether the relevant link is provided with the intention to make a profit? Or should rather one consider the surrounding environment to the relevant link, eg whether it is provided on a website that is operated for profit? Although both alternatives appear plausible, consideration of the context in which the relevant link is provided appears to be more in line with earlier CJEU case law and, now, Filmspeler. In both SGAE and FAPL, in fact, the Court considered that the profit-making nature of the communication was apparent from the fact that the defendants transmitted the relevant works in their own establishment (hotels and a public house, respectively) in order to benefit therefrom and to attract customers to whom the works transmitted are of interest. The next, topical, issue to address was whether the streaming of unlicensed content could result in liability infringement of the right of reproduction or could be, instead, excused under the exemption for temporary copies within Article 5(1) of the InfoSoc Directive. As readers know, the exemption within Article 5(1) is subject to five cumulative conditions that must be interpreted strictly: (1) the act of reproduction is temporary; (2) it is transient or incidental; (3) it is an integral and essential part of a technological process; (4) the sole purpose of that process is to enable a transmission in a network between third parties by an intermediary or a lawful use of a work or protected subject matter; and (5) that act does not have any independent economic significance. In addition, Article 5(1) is subject to the three-step test in Article 5(5). The CJEU held that the acts of reproduction at issue do not relate to a lawful use of copyright works, also because the main attraction of Filmspeler’s player is the pre-installation of the add-ons. 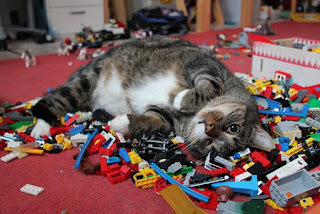 In addition, and as a consequence, the resulting temporary acts of reproduction are such as to adversely affect the normal exploitation of those works and causes unreasonable prejudice to the legitimate interests of the right holder . As mentioned, the background proceedings in Filmspeler relate to a very specific factual background, so I expected that the resulting CJEU decision could have limited impact. Watch out what you're watching! As regards the construction of communication to the public, two main aspects are worth noting. First, that facilitation is seemingly akin to intervention, which arguably does not even need to be ‘indispensable’. This makes me think when the CJEU decides Ziggo, it will follow AG Szpunar [here] and hold that a subject like The Pirate Bay makes acts of communication to the public, and is primarily liable for copyright infringement. In the immediate aftermath of the AG Opinion in Ziggo and the CJEU decision in Filmspeler some commentators have submitted that the CJEU has de facto harmonised secondary liability, ie an area of copyright that has not been formally harmonized at the EU level. That might be true, but it is important to note that not all EU Member States envisage a secondary liability regime for copyright infringement. The second aspect is that after Filmspeler it should be clear that one’s own profit-making intention should be appreciated in relation to the context, ie surrounding environment, in which the allegedly infringing act takes place, rather than whether the actual act of infringement is motivated by a profit-making intention. This, as seen from the early national applications of GS Media (particularly in Sweden and Germany), should broaden the situations of prima facie infringement. Turning to liability for unlawful streaming, just a few weeks ago the Derbyshire Council Trading Standards in the UK submitted that streaming unlicensed content would not give rise to liability. After Filmspeler, this does no longer seem true. Although there might be a discussion as to whether the acts of reproduction are actually made by the viewer (rather than the site that hosts the stream), it appears that now the case of unlawful streams is fully comparable to that of unlawful downloads. In fact, the reasoning of the CJEU in Filmspeler closely resembles that in ACI Adam [Katposts here], ie the case concerning whether unlawful downloads of copyright works could be covered by the private copying exception. All in all, Filmspeler is a very good victory for rightholders: this is so as far as their enforcement efforts are concerned, but also in relation to lobbying work at various levels – notably the EU and the drafting of a ‘value gap’ provision. Readers will be aware that last month a sculpture by Kristen Visbal, entitled Fearless Girl, was unveiled in Manhattan's Financial District as an advertisement for an index fund which comprises gender diverse companies that have a higher percentage of women among their senior leadership [read the Wikipedia entry here]. 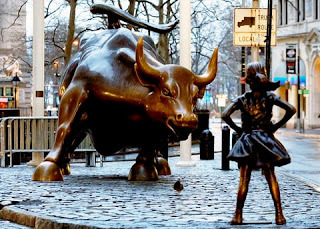 Fearless Girl was placed opposite the well-known (originally guerrilla art) Charging Bull by Italian-born sculptor Arturo Di Modica. It is arguable that it is indeed because of this particular positioning that Visbal's artwork appears so powerful. 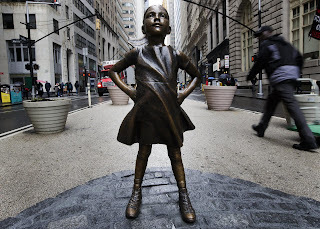 Initially Fearless Girl was expected to stay in place just for a few weeks, but in late March it was announced that the sculpture would not be removed until February 2018. 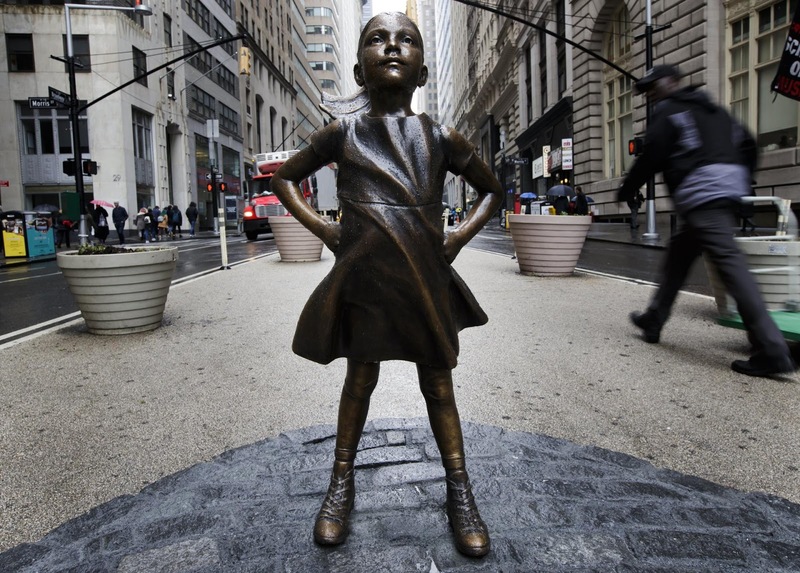 Despite some criticisms, one of the reasons of the success of Fearless Girl appears to be its perception as a symbol of female empowerment and strength. Visbal has stated that she was careful to keep the girl's features soft to communicate that she is not defiant or belligerent: she is rather brave, proud and strong. Not everyone, however, appears happy with the statue remaining: several newspapers report that later today Di Modica will hold a press conference explaining more at length why he intends to challenge the decision of New York mayor Bill de Blasio. The principal reason why Di Modica is against Fearless Girl seems to be that he believes that the integrity of his bull is in peril: contrasted with the soft, altruistic characteristics of the bronze girl, Charging Bull now appears menacing and aggressive, according to its author. Di Modica might bring an action for copyright infringement. But what chances of success would he have since no economic rights seem at stake in this case? What Di Modica might have in mind is an action based on moral rights infringement, notably the right of integrity. At the international level it is the Berne Convention that articulates the minimum legal content of the moral rights of attribution and integrity, as developed by continental European case law and doctrine. Article 6bis states that, independently of the author's economic rights, and even after the transfer of the said rights, the author shall have the right to claim authorship of the work, and object to any distortion, mutilation or other modification of, or other derogatory action in relation to, his/her own work, that would be prejudicial to his/her honour or reputation. Since the Convention merely provides minimum standards, the way in which Berne countries have intended and applied moral rights varies greatly. Differences are pronounced even within Europe. In some, so-called ‘monistic’ copyright regimes, eg Austria and Germany, the moral rights last as long as the economic rights. In the UK and Ireland, moral rights likewise last as long as economic rights, but in these Member State moral rights may be waived. In the ‘dualist’ conception of copyright in droit d'auteur jurisdictions, such as France and Italy, moral rights are separate from patrimonial and economic rights, are perpetual, and may not be waived. As far as the US is concerned, moral rights protection is currently [the US Copyright Office is undertaking a public study on moral rights] narrow, especially if compared to droit d'auteur jurisdictions. Introduced in 1990 through the Visual Artists Rights Act, §106A of the US Copyright Act is arguably the only moral right provision under US copyright law, and its scope is limited. While acknowledging the moral rights of attribution and integrity, this provision only applies to 'works of visual arts' which are narrowly defined under §101. 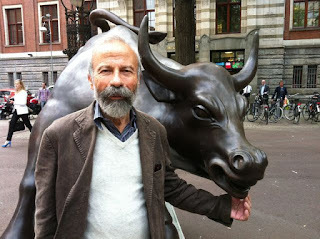 Although Di Modica's sculpture might potentially qualify for protection under §106A, the right of integrity envisaged therein is only actionable in relation to a "distortion, mutilation, or other modification of the work which would be prejudicial" to the honour or reputation of the author. Arguably Fearless Girl and its positioning have not resulted in any derogatory action on or treatment of Charging Bull. It would appear that in the present case §106 could not be an easy one for Di Modica to rely upon. While under US law he might have claims under other areas of the law (possibly defamation? It might be far-fetched but perhaps not to be ruled out at the outset), if he wished to explore if any opportunities under copyright law might be available, then he might want to explore his Italian roots a bit further. Being an Italian citizen, he could in fact rely on Article 185(1) of the Italian Copyright Act in fact clarifies that the provisions contained therein are applicable to any works by Italian authors, wherever published for the first time. However, also in this case, the damage at issue (which does not necessarily require a treatment of or action in respect of the work) must be prejudicial to the honour or reputation of the author, not the work. Is the positioning of Fearless Girl to be regarded as prejudicial to the honour and reputation of Di Modica? For a court that might be hardly the case, even within a moral rights-friendly legal system. It will be interesting to hear what Di Modica says in his press conference, and whether any proceedings are actually brought. In any case, litigation based on moral rights alone might be hard to win. But what do readers think? 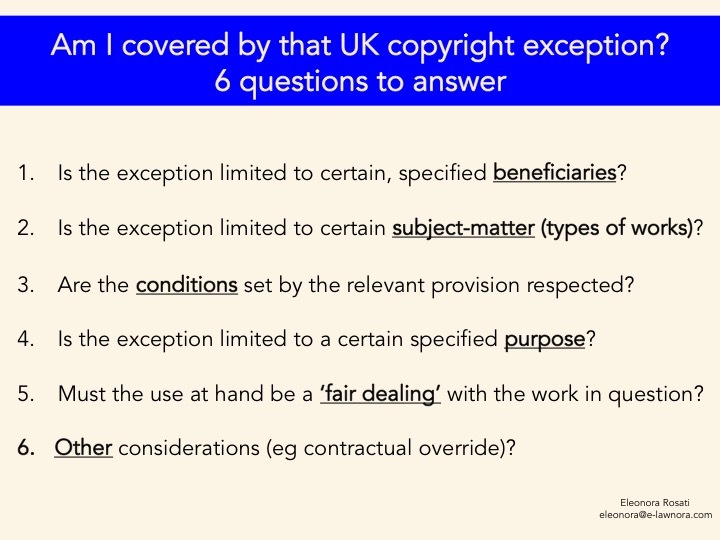 As part of my IP Materials Series, I have prepared a high-level checklist for my students (currently busy with their IP revision) of the questions to ask when determining whether a certain exception in the Copyright, Designs and Patents Act (CDPA) is actually applicable to the case at hand. Answering questions a) and b) serves to rule out at the outset the applicability to the particular case considered of exceptions whose beneficiaries are limited (eg in the case of exceptions for libraries, archives, public administration, educational establishments, persons with disabilities) or only apply to certain types of works (eg computer programs or databases). In a sense, these are preliminary questions to be considered and addressed. The core of the assessment regarding the applicability of a certain exception to a specific instance is answering questions c) to e). Question c) requires consideration of whether a certain exception requires a number of conditions to be satisfied. For instance, the new (introduced in 2014 and yet to undergo judicial consideration) exception for quotation within section 30(1ZA) requires that: (1) the work has been made available to the public; (2) the use of the quotation is fair dealing with the work [this would go under question e)]; (3) the extent of the quotation is no more than is required by the specific purpose for which it is used, and (4) the quotation is accompanied by a sufficient acknowledgement (unless this would be impossible for reasons of practicality or otherwise). Question d) requires one to determine whether the exception considered is only applicable to use of a work for certain, specified purposes. While section 30(1ZA) does not require that the quotation is made for any particular purposes, the same is not the case for other exceptions, such as criticism o review (section 30(1)), news reporting (section 30(2)), caricature, parody or pastiche (section 30A). "any hard-and-fast definition of what is fair dealing, for it is a matter of fact, degree and impression. However, by far the most important factor is whether the alleged fair dealing is in fact commercially competing with the proprietor's exploitation of the copyright work, a substitute for the probable purchase of authorised copies, and the like ... The second most important factor is whether the work has already been published or otherwise exposed to the public ... The third most important factor is the amount and importance of the work that has been taken. For, although it is permissible to take a substantial part of the work (if not, there could be no question of infringement in the first place), in some circumstances the taking of an excessive amount, or the taking of even a small amount if on a regular basis, would negative fair dealing." Finally, answering question f) requires one to consider other factors that might have an impact on the actual applicability of a certain exception. So, for instance, while applicability of the exception for caricature, parody or pastiche within section 30A cannot be overridden by contract (such terms would be unenforceable), the exception is without prejudice to an author’s moral rights. Is the exception limited to certain, specified beneficiaries? Is the exception limited to certain subject-matter? Are the conditions provided for in the relevant provision respected? Does the relevant provision envisage that the use is for a certain specified purpose? Must the use at hand be ‘fair dealing’ with the work in question? Other considerations (eg contractual override)?